Just out from Nightshade Books is Osiris, the first novel from London author E. J. Swift, and the first in a trilogy called The Osiris Project. We've got an excerpt. Rising high above the frigid waters, the ocean city of Osiris has been cut off from the land since the Great Storm fifty years ago. Most believe that Osiris is the last city on Earth, while others cling to the idea that life still survives somewhere beyond the merciless seas. But for all its inhabitants, Citizens and refugees alike, Osiris is the entire world—and it is a world divided. Adelaide is the black-sheep granddaughter of the city's Architect. A jaded socialite and family miscreant, she wants little to do with her powerful relatives—until her troubled twin brother disappears mysteriously. Convinced that he is still alive, she will stop at nothing to find him, even if it means uncovering long-buried secrets. Vikram, a third-generation storm refugee quarantined with thousands of others in the city's impoverished western sector, sees his own people dying of cold and starvation while the elite of Osiris ignore their plight. Determined to change things, he hopes to use Adelaide to bring about much-needed reforms—but who is using who? As another brutal winter brings Osiris closer to riot and revolution, two very different people, each with their own agendas, will attempt to bridge the gap dividing the city, only to find a future far more complicated than either of them ever imagined. 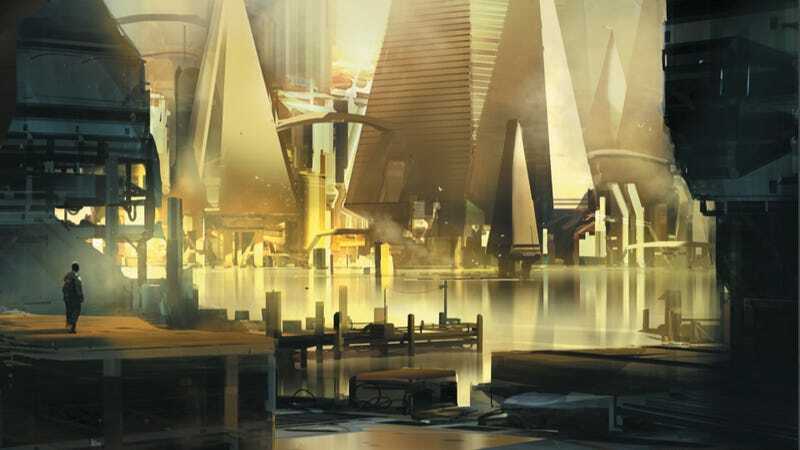 Osiris is the beginning of an ambitious new science fiction trilogy exploring a near-future world radically transformed by rising seas and melting poles. And here is an excerpt from chapter 2. Vikram's watch ticked off the seconds with silent, calculated precision. It was nearing half ten o'clock; the appointed time of Eirik's death was eleven. Vikram had already been here for over an hour. The boats had gathered early. His hands were shaking. He clenched them into fists, catching shreds of torn lining in the pockets of his coat. Something had changed when he woke today. A tight band squeezed his chest, constricting the airflow and his heart. He could not have said what it meant; for so long he had felt only a blankness tinged with fear. He stood at the boat rail of a rusting waterbus anchored far back in the crowd. The Council had chosen to stage the execution near the north end of the border, where four soaring towers cornered an impromptu square. On the western side, the sea was carpeted with boats, every craft jammed with westerners who had congregated, whether to witness a spectacle or out of disbelief that it would be carried through, Vikram could not tell. Apart from a few officials and the skadi, there were no Citizens on the surface. They were all inside, locked away behind window-walls, or listening to a reporter describe the scene on their o'dios. "Mind if we squeeze in here?" The man was a head shorter than Vikram, his breath misting in the cold, steering a child of perhaps eight in front of him. Vikram moved along the rail. What could he say? He glanced at the kid, a boy, whose expression was open and curious. He wanted to ask the man if it was right the boy should witness such a thing, but to draw any attention was risky. There was always a chance that one of the skadi might recognise him. They did as they pleased, and in the event of any trouble, Vikram's record would count against him. The thought of going back underwater was enough to bring sweat trickling down his back. "They say he's the NWO leader," said the man. "Eirik 9968. They say he's number one. What do you reckon?" He could have said a lot of things. He could have said that he had known Eirik like a brother, once. But between the rumours and the krill speculation and what Drake and Nils had told him, he no longer knew what or who to believe. The kid pointed to the tank, sat on the deck of a barge a hundred metres away, beyond the front line of western boats. Behind it, the border rose out of the waves, its rippling mesh wet and dripping with seaweed. "Is that it?" said the kid. "They'll bring him out soon." Soon. In a matter of minutes, he had to watch Eirik die. Vikram thought he might cry, or shout out, or be sick. If he only knew if the man was guilty or not! He drew in a deep breath. When he exhaled the air came out loud, too loud, the woman on his other side turned her head to look. He had thought that his face was blank, but you never knew what really showed. Vikram had seen fear and horror spark in the most hardened of features: the emotion sudden and unexpected, like electric light in a dark window. Keep yourself empty, he thought. A pebble at the bottom of the ocean. A bit of kelp. When it's happened it's over, done. Then you move on. That was what the three of them had agreed, him and Nils and Drake. They would go to the execution, because they couldn't stay away. But they would do nothing. There was nothing they could do. Eirik's sentence had finally been announced in early summer, eight months after Vikram was let out of jail. There had not been a public execution since the six Osuwa criminals were shot at the border twenty-eight years ago, for an alleged act of terrorism at the university. Even Vikram knew that Eirik had committed no acts of terrorism. The Citizens were going to execute him anyway. Was the City actually scared of the west? How could they be, when there wasn't a single coherent movement or activist group? The west was in chaos, crippled by food shortages and drug trafficking and the continual power failures. The shanty towns were terrorised by gangs who imposed illegal levees and warred continually amongst themselves. Once every few months there might be a straggly protest at the border, mute and seemingly purposeless, but it didn't take a Councillor to work out that the west was in no position to threaten anyone. Twenty minutes before eleven. The back of Vikram's neck tingled with the bitter cold. He pulled up his scarf. In a couple of weeks, he'd need two to go outside. It was an incongruously clear, pretty day, the sky palest blue and utterly empty. Under its expanse Vikram felt the unsettling jumble of freedom and an at times incapacitating terror of losing it again, which had dogged him ever since he got out. Around the towers, waves slapped the decking with light, almost playful gestures. The waterbus he stood upon with twenty other westerners rose on the swell. A skadi boat glided down the edge of the crowd. They had a fleet of barges and speeders, and they had strung a line of buoys to fence in the western boats. The skadi were dressed bulkily in their habitual black. They were all armed with guns and tasers. One of them had a speakerphone. "You will stay behind the barrier. You will not move your boats. Any attempted action will meet with severe punishment." The execution boat, anchored between the western crowds and the City, was a squat, ugly craft, surrounded by clear water and painted entirely black except for the prow, where someone had daubed two white orbs and the teeth of a shark. The deck was flat. On it, the transparent cube reflected the towers on either side and the people and the empty waiting sky. The wind blew spray into Vikram's face and he licked the salt from his chapped lips. It stung, an unwelcome reminder that he was really here. He was alive, and awake. The speakerphone crackled. "You will stay behind the barrier. You will not move your boats…"
Vikram was nine years old when Mikkeli first brought him to the border. From his earliest memories, he had heard people talking about the infamous waterway. It was a subject which made voices change, and sometimes faces too. In Vikram's young world, which consisted mostly of places he could not go or things he could not do, this barrier dividing the west from the City was a concept at once as solid and as transient as the sky. On that day Mikkeli had blagged two passes on a waterbus and sneaked Vikram up to a balcony sixty floors above surface. Once they were safely installed, she unwrapped a package of fried squid and kelp. She said that someone had given her the food, which was a lie. Vikram knew Mikkeli had stolen it because he had heard the fry-boat woman yelling at them earlier as they ran away over the raft rack. They shared the squid rings, greasy and chewy on the inside but coated with thick, salty batter. Mikkeli gave Vikram most of the kelp squares. She pointed outwards. "Look over there," she said. "See them towers?" "Yeah. They're all silver." That was his first impression of the City. Silver and glorious, like the morning sun on the waves. "We can't go there," said Mikkeli. Her voice sounded strange. Vikram could not work out if she was cross or if she might actually cry. He thought about what Mikkeli had said and decided that there must be a reason for it. "Why can't we go there?" "'Cause we're westerners, that's why. We're not allowed." "'Cause it's the rules. The Council's rules." Mikkeli spat over the balcony rail. Vikram leaned forward to see the gob of spit fly and Mikkeli grabbed his collar and pulled him back. "Stupid old gulls, Naala says. Stupid gulls who make stupid rules. You see, Vik, our mum's and dad's folks, they weren't born here. They came from some place else." "I know that. I'm not an idiot." "No, you're clever, that's why I'm telling you this. "'Cause it's important. And it's not fair. Why do we get left in this dump and them Citizens got heating and 'lectricity that works all the time and you know what else they've got? They've got the o'vis." The yearning in Mikkeli's voice reminded Vikram of hours spent waiting outside the fry-boats, smelling the smell of hot squid, knowing that it would be long past twilight before leftovers. "Naala actually saw an o'vis once. She said it's amazing. You can watch ancient filmreels the Neons made; the newsreel and animés and everything." "This announcer thing they got, tells you information and stuff, like if someone dies, everyone knows 'cause it's on the feed…"
Mikkeli talked on. She told him weird and wonderful stories of a fabulous world where people went to parties and wore beautiful clothes and watched acrobats and then stuffed themselves with weqa and fish until they vomited. People didn't get sick in the City, she said. They didn't get horrible coughs and die in the night. The Citizens did peculiar things. They kept animals in their rooms—as pets. They wore coats with bird feathers inside. They had gliders. If they wanted to come to west Osiris, which they didn't, they were allowed to whenever they liked. Vikram listened. He looked at the sleek, silver towers. The shuttle lines looked like jets of blue fire leaping from one gigantic cone to the next. Fire was one of Vikram's favourite things in his limited world. "Can't we just go to look around?" he asked. "No. Look down there—careful! Naala'd murder me… See that net coming out the water? Goes down as far as the sea mud. People say the Tellers tied it, right at the centre of the earth. But that's all lies. The Council wanted to keep us out so the skadi put it there." "We can't go ever? Not when we're older?" Vikram wanted to be sure. "Did you listen to what I said? Never ever. You try and cross that waterway down there without a tag that says you're a Citizen, the skadi shoot you—zap! Just like that. They hate us, they call us dogs. Look, look, there's a boat of 'em going past right there, that dirty black speeder. Naala told me it all. I wasn't even meant to bring you with me, it's that dangerous." Vikram saw a gull fly past the nearest tower on the other side. The light, reflected from a window, turned the bird for a second into living gold. Everything that was beautiful belonged to the Citizens. "Then why did you?" he said angrily. "Why did you bring me?" It seemed like the most unfair thing that Mikkeli had ever done. But Mikkeli was unimpressed at his outburst. "Because Vik, one day someone's got to do something about it, and it might as well be us. Right?" He looked from the waterway, where the low-lying skadi boat was gliding past one of the silver cones, and back to Mikkeli. Last week, she had stolen a new garment: a yellow hood. Within its furry halo her face was deadly serious. Vikram would have done anything for Mikkeli. Nine minutes to eleven. Vikram shivered uncontrollably. He could not take his eyes off the boat. With its unkind mission, the vessel itself seemed to have acquired a mesmerising power. Each of its component parts was imbued with more than simple menace; the cracked graffiti eyes, the crew posed at stiff attention, gun barrels protruding from their shoulders, the waves lapping and the creak of the hull. There was something inherently wrong about the scene. The boat's natural purpose had been reversed. It would no longer protect life; it carried a tomb, clear and silent. The kid on Vikram's right fidgeted, looked up at his father. "Not long now," said the man. Vikram wondered if there was anyone in the crowd who had plans to break Eirik out. He felt the tension of the crowd, really felt it, the way he'd sensed unease three years ago, the day the riots began. Who else had Eirik known? Did he have allies? Colleagues? Were there members of the New Western Osiris Front in the crowd? Had they ever been anything more than a rumour, or had all of those dissidents quietly disappeared after the riots were crushed? Perhaps everyone present today was simply relieved that a scapegoat had been found and that it wasn't them. He gauged the thickness of the glass construction, wondering if a single shot would break it. He remembered, distantly, the feel of a gun in his hand, that sense of absolute power and invulnerability. It had proved false, like everything else. The skadi would have prepared thoroughly. They always did. Only another few minutes. There was no sign of Eirik. "Maybe they'll cancel it," said the woman next to Vikram. He looked at her properly for the first time. She was old, at least fifty, and wheezing in the cold air. She probably had tuberculosis. He remembered Mikkeli's lilting voice—people don't get sick in the City, Vik. He wanted to ask the woman her name, but could not trust himself to know even this tiny piece of personal information. "It's just an act," he said—whether to convince himself or the woman he did not know. The crowd murmured impatiently. Where was the condemned man? Vikram had not seen Eirik since before the riots. Even if he had wanted to, prisoners were allowed no visitors. Underwater, the information that Vikram overheard came in drips and leaks. A whisper, across cells, that Eirik had confessed. Months later, in the breakfast line, rumours of the tribunal. He hadn't been sure about Eirik at first. It had always been the four of them: Vikram and Mikkeli, Nils and Drake. Mikkeli, as the oldest, was the leader. None of them had family; they had grown up on the boat and later they lived together in a single room. They squabbled and got into fights, they tried and sometimes succeeded in finding work and eventually, when their circumstances could no longer be viewed entirely as a joke, they had talked, talked seriously, and they had founded the New Horizon Movement. Their ideas were popular. Others joined. The talks grew to meetings of fifteen or twenty people, but they were always the core. One night, Mikkeli brought Eirik back to talk to them. Vikram remembered Eirik walking into their favoured bar for the first time, tossing his coat onto the table, drawing up an empty keg. They had been in the middle of a heated discussion. When Eirik sat down, they all stopped talking. The silence was expectant. "Well," Eirik said. And looked at them all. A canny, knowing look, but somehow gleeful, as though he was pleased with life and what it offered, and even how it found him. "Well." He remembered Mikkeli, sidling forward, a shyness about her. Vikram had never seen her like that before. "This is Eirik," she announced. "He wants to hear about Horizon." Vikram was suspicious. He could tell that Nils and Drake felt the same way, sensed them bristling beside him. "Show him the letters, Vik," said Mikkeli. She spoke to Eirik. "Every week we send a letter to the Council. Vik does the writing for us. He's the smart one." "He doesn't want to see those, Keli." "That's our business," Nils interjected. "We don't know who this guy is. No offence, Eirik." Eirik smiled. "None taken. How about we all get a drink instead?" Later, Eirik took Vikram aside. "I didn't want to make you feel awkward, Vikram, but I'd be interested to see what Horizon sends to the Council. There's too much talk of violence out there. It's understandable but it won't work. We need to use our heads." "He's a spy," said Nils, when Mikkeli and Eirik had left and Vikram relayed what had been said to the others. "He's almost forty." Drake emptied the dregs of a tankard into her mouth. "Old, but no grey hair," she said simply. "Don't you think that's interesting?" "Clearly Keli does," said Nils sourly. "I'm not sure he is a spy." Vikram was thoughtful. "But he looks like us." Eirik had what they all had—the unmistakeable taint of the west. It wasn't just the general shabbiness and the permanent smell of salt from water travel and poor diet. It was something in the eyes. Part wariness, part resignation; a continual expectation of the worst, as though by acknowledging, almost welcoming the worst of their situation, they could somehow ward off the reality. According to the only survey ever carried out in the west, by the Colnat Initiative, life expectancy in the west was an average of forty-three. The years before, filled with sickness and unemployment, would become increasingly harsh. They all carried this knowledge on their faces, and the only time Vikram actually noticed it was when he saw someone who did not look like that. Like the skadi. Eirik came back. One by one he won them over. Part of the lure was undoubtedly that Eirik knew how to talk. "You people are exactly who I've been looking for," he said. When Vikram showed him the transcripts of their letters, Eirik was visibly excited. "These are great ideas! Joint fishing missions, that'll appeal to the anti-Nucleites, they're desperate to get further out of the city. And if you rephrased a few things—you don't mind me making suggestions? Like here, you talk about reducing security at checkpoints—what you want to say is border reconciliation. It's all about the jargon." "How do you know this stuff? Who taught you?" "You learn to pick things up. Odd jobs in the City—I always scan their newsfeed. Listen to them talking. Know your enemy, Vikram. It's the oldest rule in the universe." Then he began asking questions. So now we know what we want—how are we going to get it? It was we, right from the start. That had made them feel good. And it was a valid question, to which none of them yet had an answer. This was what they sat around arguing about for nights on end. They had been happy enough doing that for a while, with Vikram composing the letters, and occasional suggestions that they might organise a protest. Mikkeli had come up with a series of slogans. But after Eirik showed up they started noticing other things—like the fact that one electric bulb did not produce adequate light even in the summer, and that no amount of well-written words could assuage the fact that none of them had had a decent meal in weeks. "We need to engage with the early justice groups," said Eirik. "Get right back to the start. The Western Repatriation Movement, they were good people—you know about them? They sent the first official refugee delegate to the Council, seven years after the Great Storms and the first immigrants arrived. The Council made promises, of course. The western quarter's only temporary, they said. Give us eighteen months to restructure the city, we'll find you somewhere decent to live. Eighteen months go by, the delegates return, they warn the Council that people are getting angry, and the Council places them under house arrest—idiotic move but they were probably scared shitless. That's what led to the rise of the New Osiris Affiliation, and they led to the second wave of riots, and what happened at the Greenhouse, and finally, thirty-nine years ago, to the border. That border's as old as I am. We've grown up together." He sat back and held their eyes, one by one, steadily. "Everything," he said. "Has a root." Eirik's voice was thoughtful and inevitable like a tide. They could listen to him for hours. It seemed that Mikkeli's adulation had proved well founded. They had followed her and she had needed someone to believe in as much as the rest of them. It was only Eirik himself who seemed to wander, fleet as foam, unhindered by such petty concerns as doubt. As the weeks passed, Vikram noticed shifts in attitude. At first it was small things. There was less attention to the letters. Instead of helping him dictate, the others might talk about an incident at the border. A man who had been detained at the checkpoint for forty-eight hours without reason. A woman, beaten up, who had lost an eye. Phrases crept into conversation: if only I'd been there. Vikram found himself only too happy to join in. The lack of response to the Council missives began to feel like a personal insult. Did they even read what was sent? Was there any point in writing at all? He started revisiting old childhood haunts, by the border. The towers on the other side seemed brighter and more blinding than ever and his hands would itch with inactivity. He clearly remembered turning to Nils one day and saying, "If something happened this winter—if people decided to riot—what would you do?" Nils said without a flicker of hesitation, "I'd kill as many of those skadi bastards as I could." "Course not Citizens. What d'you take me for?" And then came the morning of strange quiet, the day the riots began. The day that everything fell apart and the skadi came for Eirik. The City published findings that they said proved Eirik was NWO. He'd gone from group to group, they said, winning trust, gaining followers. Recruiting. They gave him a number. For Eirik, after three years in a seabed cell, death might be a relief. He wondered if Mikkeli's ghost had lingered with the other man whilst he was underwater, the way she had with Vikram, presenting him with her lifeless body over and over again, the tattered yellow hood that fell back from her face drenched to ochre. Did Eirik even know she was dead? The second hand edged past eleven o'clock. Something was happening. Birds, alert to the change in mood, began to swirl overhead. A curious gull dove low over the boats. Of course the birds would come today. The hatch on the execution boat had opened. A skadi officer emerged. He came to stand at the rail, hands clasped behind him. Wide sunglasses wrapped around his head caught the sun as he turned this way and that. The officer barked an order. Eirik was led out from below deck. He must have been kept there all along, in darkness. Vikram strained his eyes, desperate for a glimpse of Eirik's face, but it was concealed behind a dark hood, part of a prisoner's suit. A frisson went through the crowd. "That's him… that's Eirik 9968…"
Eirik seemed to move as one in a dream. His hands were manacled in front of him. The man leading him gave tiny jerks upon the chains, and Vikram could hear their clank beneath the ever present rush of the ocean and the whispers of the audience. The executioner checked the tank. He rapped the glass on each side and on the roof. Two skadi on either side of Eirik held his arms. They turned him towards the western crowd, but his head flopped on his chest, and his face remained in shadow. He's drugged, Vikram realized. He felt anger stirring at their cowardice, mixed with a horrible relief that Eirik would barely be conscious. The air keened as a dozen loudspeakers were switched on. The wheezing woman next to Vikram covered her ears. The man to his right squeezed his boy's shoulders. Vikram wanted to wrench the kid away and cover up his eyes. In the next breath he thought no, he should see this. He should know what the Citizens do to us. A voice began to speak. The tone was clipped and robotic. "The man known as Eirik 9968 has been sentenced for his actions against the city state of Osiris. He is found guilty of the following crimes: denouncing the Osiris Council, organising collective violence against the City, inciting aggressive action in westerners, acts of personal terrorism, assault and mass murder. In particular he is convicted for his role in reviving the illegal New Western Osiris Front, the organisation responsible for the atrocities committed at Oswua University in the year twenty-three eighty-eight, and for leading and instigating the July riots three years ago. He is judged responsible for both the deaths of Citizens and the necessary reprisals against the west." Eirik made no reaction to this speech. His posture was bowed and defeated. It was doubtful whether he had even heard the accusations. Confronted with that small, lone figure between two cities, all Vikram could think of was Eirik sat cross-legged in Nils's room, leaning forward, gesticulating as he spoke, his face intense and serious, half illuminated by the flickering light. Look, it's not enough to know the history—we've got to know how these people think. Why won't they take us seriously—why won't they answer Vik's letters? Because we don't use their language and we don't understand their systems. We don't know who they really are. The memory was so strong it made him giddy. Vikram could hear Eirik's voice perfectly; he could see that room, smell the empty wrappers of squid and kelp. His head swam. Instinct told him the truth. In that moment he knew, with absolute and shocking conviction, that everything that had been said about Eirik was a lie. Because Eirik, who did know the language, had been a threat. He might actually have made people listen. And the City couldn't let anything threaten the divide, so the City were going to remove him. Maybe Eirik had helped to feed the riots. Did it matter? It was not a terrorist who had thrown the first fire torch. It was an ordinary westerner like Vikram, who had been up against the border and everything it represented too many times, and in a single moment of frustration had cracked. Anyone could have started the riots. The officer on the boat drew himself up, concluding his speech. "For this long and atrocious history of criminal activity, the Osiris Council has condemned Eirik 9968 to death by drowning." Want more? You can pick the book up in paper or electronic versions from Amazon.